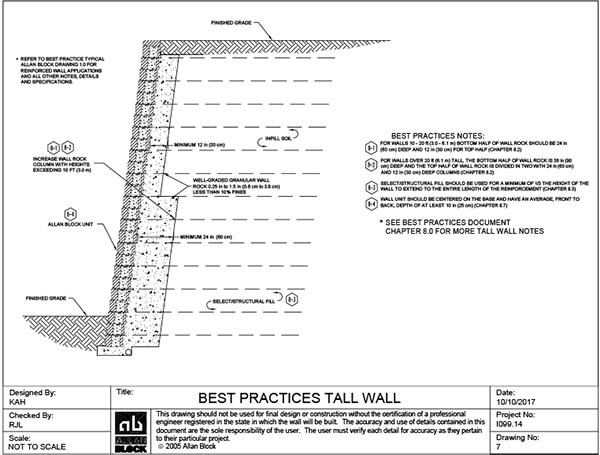 8.1 Tall Wall Considerations are to be employed with structures rising to a height of between 10 – 15 ft (3 – 4.6 m), depending on the application and thediscretion of the wall design engineer. A 10 ft (3 m) high wall structure with a slope or structure above would be considered as a tall wall, while the same wall height constructed with a level condition above the wall without any additional surcharge may not require consideration as a tall wall. Several factors may change a typical design when structures reach these defined higher levels such as the depth of wall rock, increased design parameters, enhanced structural fill and global stability analysis requirements. 8.2 Wall rock depth behind the block and material used. Site conditions and wall height should make the engineer consider expanding the depth and or size of material used. Typical wall rock depth will vary with wall height, if select/structural fill is not utilized in the reinforced mass, Figure 8-1. 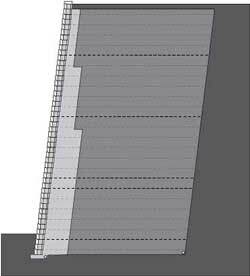 For wall applications between up to 10 - 15 ft (3 – 4.6 m) as discussed in section 8.1, 12 in (30 cm) typical depth top to bottom. For walls from 10 - 20 ft (3 - 6.1 m) tall, the bottom half is suggested to be increased to 24 in (60 cm) deep and the top half to be the typical depth of 12 in (30 cm) deep. For walls over 20 ft (6.1 m) tall, the bottom half is suggested to be increased to 36 in (90 cm) deep and the top half is divided in two with a 24 in (60 cm) deep column and a 12 in (30 cm) deep column at the top. 8.3 For tall walls the engineer should increase design parameters of compaction and wall rock usage. Select/structural fill should be specified for the minimum bottom 1/3 to 1/2 of the reinforced fill. An Internal Compound Stability (ICS) analysis can aid the designer to determine if greater select/structural fill heights are required. The use of additional select/structural fill should extend to the entire length of the reinforcement. This fill material should have a PI of less than 6 for walls up to 20 ft (6.1 m) and for taller walls the material should have a PI of zero. An example of what type of fill should be considered for this area would be compactable sands or gravels. The engineer must carefully review the site geometry and structures above and below the wall to adequately plan for the use of the land placed into service by the retaining wall structure. A single test/confirmation for each of the items listed would not be considered adequate. A detailed construction log should be used with sign offs at incremental levels by the responsible parties. Consider how much potential settlement will impact structures above the reinforced soil mass. Consider increasing compaction requirements from 95% of standard proctor to 98% to minimize settlement where essential to the application. A detailed review and implementation of a water management plan is essential. This should include a detailed drawing for water collection and water flow diagrams for both above and below grade drainage. Below grade utilities and above grade structures should be included in the overall site design to ensure that site details such as storm drains and curb and gutters do not influence the overall wall envelope or effect performance. Unless designed to accommodate hydrostatic loading, it is essential that the reinforced soil mass not be exposed to outside water sources that would rise above the level of incidental water. As walls get taller the internal stresses increase and depending on the soils used, can cause lateral loads pushing on the back of the facing. To minimize internal lateral loads on the Allan Block facing, it is recommended to utilize the described soils above and to expand the depth of the wall rock column behind the facing, See Section 8.2.b for more information. Expanding the wall rock zone behind the wall also reduces down drag forces on the geogrid caused by localized settlement and allows for easier compaction directly behind the block. In addition to the compaction and wall rock parameters, tall walls require the design engineer to evaluate the overall stability of the soil structure and the subsoils beneath the wall. The reinforced soil structure should be evaluated for internal settlement which may require additional select fill to mitigate. The subsoils cannot be ignored due to similar reasons. The overburden of the tall wall can cause unwanted settlements in the foundation material. Removal of the subsoils and replacement with quality select fill may be required to mitigate these possible settlements. Chapter 10.0 Global Stability - Terraced. full global/overall stability analysis should be recommended to the owner by the owner’s geotechnical engineer. Sections 2.9 – 2.11, are based on the use of a facing unit that has an average (front to back) depth of at least 10 in. (25 cm). decreases, so does the stability of the facing, particularly overturning resistance during construction or while in service.